A unique Beauty and the Beast retelling, Uprooted primarily takes place in a magical valley that is overseen and protected by a Lord known to the villagers as the Dragon. On the border of the valley is a mystical Wood that is full of evil power. In exchange for the Dragon’s protection, the villagers must sacrifice one of their girls to work in his servitude for 10 years. After which, she will be released and a new girl will take her place. By the time Agnieszka is 17 years old and now eligible to be the Dragon’s next servant the rumors of what happens to these girls has spread and grown throughout the valley. With none of these rumors being positive, the only thing dampening Agnieszka’s fear is the fact that everyone knows her best friend Kasia is the girl who will be chosen. With Kasia being the most beautiful and accomplished girl in their valley, there is little doubt that the Dragon won’t look at the other girls. He does however, and when he sees Agnieszka, he sees something that none of the other girls have and he has little choice but to take her back with him as the chosen girl. Review: I loved so many things about this story!!! 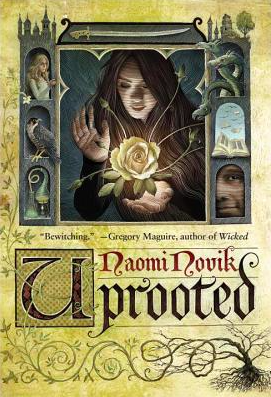 First, I love Fairytale retellings, but what is especially great about Uprooted is that is has shades of Beauty and the Beast but is still unique enough to be its own story. Novik still inputs plenty of her own creativity to really bring this story to life. I also loved the gender equality in this novel. I don’t want to give much away because I think it is story that is more enjoyable with less knowledge, but there is some fighting and such that goes on, and the female characters are just as active in the fighting as the men. Also I applaud Novik on the amount of principal female characters in this novel. Aside from the Dragon, the rest of the main characters are women in positions of power, which was really awesome to see. Finally, I really enjoyed the romance aspect. This story wasn’t about falling in love with the Dragon and trying to change him or Agnieszka being attracted to the “bad boy”/abusive aspects of the Dragon’s character. When she first goes to his home and his treatment of her is awful, she can’t stand him and wants to leave more than anything. It isn’t until he begins making changes on his own and Agnieszka notices them that their relationship begins to take shape.